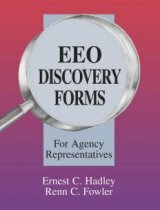 EEO Discovery Forms For Agency Representatives provides samples of written discovery to help agency officials fully develop defenses and evidence concerning the remedy demanded by the EEO complainant. Sample interrogatories, document requests, instructions, and definitions are all topically classified by the principal types of cases within the jurisdiction of the EEOC. The discovery materials presented are patterned after actual cases.